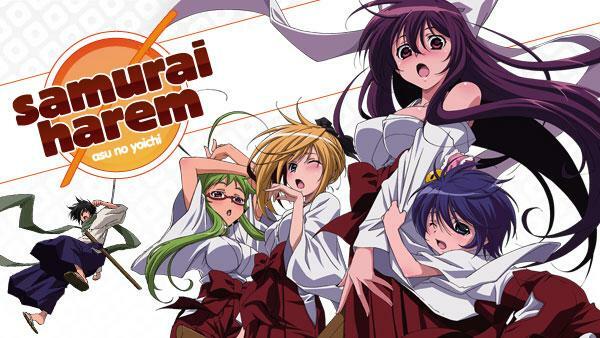 Sign up now to stream Samurai Harem, subs, tons of dubs, OVA's, simulcasts, plus the all new Dubcast℠ editions and more! Yoichi's father has been teaching him all about martial arts his entire life but now has to move to the city to learn more. E1 | A Samurai Comes! E2 | Welcome to Yokko! Yoichi is beaten up at school today. Later on that day Yoichi is challenged to a fight by Washizu and defeats him. That evening Yoichi becomes ill.
Yoichi finds the new girl, Tsubasa, in school cute. After classes end, Angela strips Tsubasa and turns her into a fighting machine. She attacks Yoichi. Ibuki and Yoichi put on a swording fighting demonstration and Yoichi ends up ripping Ibuki's clothes. Afterwards Yoichi has an interview but the girl starts to seduce him. E5 | Let’s Go On A Date! Yoichi and Ibuki go on a "practice" date because she's scared that he will damage Soaring Wind's reputation since he was asked out by Yui Hinagata. Ibuki accidentally knocks out Washizu while chasing after Yoichi. Washizu ends up at the school nurses' office. The group goes to the beach where two brothers are lying in wait to fight Yoichi. Later on everyone plays in the water but Kagome, who decides to runaway into the forest. Washizu is determined to confess his love to Ibuki via a love letter. Washizu loses the letter and Ayame finds it. Washizu is caught daydreaming by Yoichi so he hits him making him run out and shout his love to Ibuki. E10 | A Battle To The Death At A Hidden Hot Spring! While on a free trip to hot springs, the host tells Yoichi and the others that ghosts have driven quests away. Yoichi and Ibuki volunteer to exorcise the ghosts. The Saginomiya's siblings' schemes continue, as they propose the Ikarugas a "first-class celebrity" lifestyle in exchange for Ibuki. E12 | Yoichi Fights On! Yoichi, Kagome, Chihaya, and Ayame arrive at the Saginomiyas' residence and cross the river surrounding the castle using a makeshift raft.